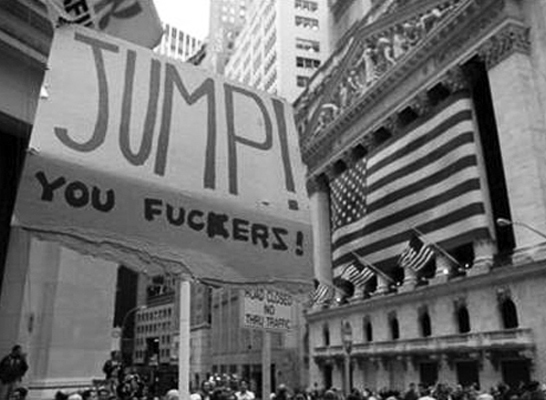 The week the financial crisis erupted, a lone protester appeared on Wall Street holding a cardboard sign reading “jump you fuckers… jump.” Perhaps it was a message for us all. We have reached another bifurcation point in history. While all eyes are on the credit crunch, less is being talked about the “eco-crunch” whose real-world losses – of habitats, water systems, species, soils – can't be bailed out. Even less is being written about the energy and food price crunch. Anyone proposing a strategy that fails to take account of these combined crunches is about to fall to earth with a bump. In the opening episode, one of the first names mentioned is Mary Meerson, so let’s start with her, to whom Godard dedicates this film. Meerson was the long-term companion of Henri Langlois who ran the Paris Cinematheque. The October Bristol Festival ‘Cinema and Video Art from Georgia’, celebrating 20 years of the twinning of the city and Tbilisi, followed with bittersweet timing last summer’s deadly conflict between Georgia and Russia. Joram Ten Brink's film The Man Who Couldn't Feel and Other Tales proposes the 'essay film' as an avant-garde nonfiction film genre. According to Brink's written PhD, which cites Vertov and Marker, this idea came out of the examination of the completed film. Showing a film raises as many questions as making a film, although it may depend on the film and the showing. I say ‘showing’ a film rather than screening a film because screening implies a screen, when it could just as well be a wall or other surface. Usually Chinese romances tell of pure love rendered impossible in forbidding societies. Red Sorghum takes place in what used to be a leper’s retreat in a desert, it couldn’t be further from the world, but the film tells a story of a love so impossible that it is barely conceived. Following her piece on the Quay brothers’ Street of Crocodiles (1986) in our Vol. 4 Issue 1 October issue, we are pleased to publish another film portrait written for Clare Kitson’s British Animation: The Channel 4 Factor. Jeff Keen was born in Trowbridge, Wiltshire in 1923. His father worked for the local landowner and the Keen family had no electricity or gas in the cottage where they lived. He worked in a branch of Sainsbury’s and in apparent preparation for the next part and, indeed, the rest of his life, took to drawing bombers. Film's end begins with a glorious scar on the face of the city. Once the end of film has been located, the eye can travel in any direction, backwards in time, forwards in time, or more profoundly into a moment of immediacy, and into the transformative space and corporeality of filmic ruination. ‘Too gruesome for words’, ‘a movie that belongs in every school’, ‘the 2001: A Space Odyssey of modern food production’, ‘eccentrically lovely and frequently horrifying’, ‘Geyrhalter, as director and cameraman, can also be compared with suspense master Hitchcock… a pure cineaste and motion scientist’. From the start it’s clear why Divorce Iranian Style (1998) won the Flaherty Documentary BAFTA, the Chicago International Film Festival Best Documentary prize, the San Francisco International Film Festival Golden Spire and the FIPRESCI Prize at the legendary Yamagata Documentary Festival. Jua Kali means hot sun in Kiswahili, but it is more than just a term. It is a philosophy, a way of life and an informal economic system. The phrase describes people who work in Kenya’s scorching sun, because they cannot afford the luxury of a roof over their heads. This is an affair of glances and reflex gestures, a local drama in which willed tenderness finds resolution in the quantum of cruelty. A young man, proud of his innocent moustache, travels in a car of floating lights. Reds, golds, yellows and blues play across a troubled face. History Is Made At Night. That’s the name of Neil Gordon-Orr’s excellent blog [http://history-is-made-at-night.blogspot.com] about the politics of dancing, “a celebration of dance as an affirmation of life in different times and places, sometimes dangerous times and places”. The fanatical ambition of a civilizational clash, whereby our democratic (?) armies would have brought ‘civilization’ and ‘freedom’ to Iraq, is having many tragic consequences, one among them being the dramatic banning of any form of understanding towards what freedom honestly and practically means. To do a proper study on the theory of cinematography, you would have to collect all films, or at least several thousand of them. When classified, these films might yield the mass of material from which you could formulate several absolutely precise laws. Cinema as a tactile, temperamental and explosive entity. Cinema as a means of production, cinema as a physical space, a production house? As an artist run public entertainment palace The Cube Cinema, Bristol, England has involved itself heavily with exhibition of all manner of art-forms to paying audiences. ‘Groups’: what are they? We could seek the answer in the archives of cultural history. Join the dots, draw a map or plot the arc. ‘Groups’ form to express a common ideal. To critique, relate collective opinions, manifest cultural actions. Self-facilitating? Following on from her remarkable campaigning documentaries McLibel and Drowned Out, film-maker Franny Armstrong has spent the last few years making her most important film yet. The Age of Stupid is a docu-drama about climate change, ecological collapse and the end of human civilisation. There is a room whose shutters are always closed. In one corner there is a book no one has ever read. And there on the wall is a picture one cannot see without weeping. In years to come, it may seem very strange that the moving image was written about accompanied only by still images. The age of new media has brought with it the means to change all this and to reconfigure the relationship between the moving image and critical writing. Expanded Cinema remains an elusive subject. It is perhaps at its most visible, and most actively engaged with, between 1965 and 1976. Yet its origins may well be latent in the earliest moments of cinema, not to mention modern visual media more broadly. Back then, before the Great War… it was not yet a matter of indifference whether a person lived or died. If a life was snuffed out from the host of the living, another life did not instantly replace it and make people forget the deceased. A well fed body and delicate complexion are but a tunic of worms and fire. The body is vile, stinking and withered. The pleasure of the flesh is by nature poisoned and corrupt. This issue is dedicated to the memory of three remarkable makers and activists for peace and justice; the poet Adrian Mitchell (born 1932), the playwright Harold Pinter (born 1930) and the citizen Richard Crump (born 1923), all of whom died in the final days of 2008 and dedicated their lives to the common cause and the greater good. They will be missed. Original Edition printed by: Cambrian Printers Ltd.